The Sauber C32 emerged out on track today at the Silverstone Young Driver Test with new bodywork, featuring a brand new downwash exhaust layout. The new sidepod and exhaust design relies on the same principles as the designs used by Red Bull Racing and Lotus F1. Just like with Sauber now, the sidepods slope down quickly and rely on this downward airflow to help push the exhaust flow down onto the car's floor. Additionally, small tunnels are built in the sidepod, underneath the exhaust outlet and just above the car's floor to allow air to pass to the centre of the car where it is blown out onto the diffuser centreline where a small opening in the diffuser can be used to generate more downforce. The design change is surprising for Sauber, as it was essentially the Swiss team that pioneered the downwash exhaust layout. In fact it was the only team that though of such a design in the winter ahead of the 2012 season. When the Sauber C31 emerged impressive during winter testing, Red Bull Racing's CTO was quoted as being the most impressed by the Sauber. He was so keen on the design that the team started work on their own version, which turned the team's struggling Red Bull RB8 into a championship winning machine. Newey however crucially though about the tunnels to feed the diffuser with more air, something that Sauber failed to materialise. In fact, Sauber believed during 2011 that McLaren's exhaust layout was a better option. 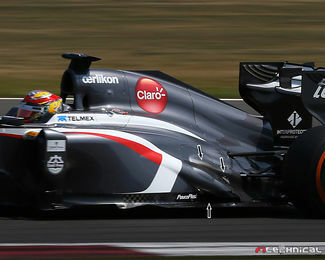 The C31 was repeatedly tested with a layout similar to McLaren, but the lack of testing meant the team opted to end the 2012 season with the downwash layout. This year's C32 then debuted with a design similar to McLaren, albeit with narrow and higher sidepods. The team finally seemed to have settled with their design, until today's unveiling of the new design, for the first time featuring a layout including ducts underneath the exhaust exits. The design was however only run briefly, as soon the bodywork started to show severe burning marks. The burning marks, which appear to be more severe than what the team experienced earlier this year in winter testing, suggests however that more development work will be needed to make this race ready. Halfway into 2013 however, it remains to be seen if Sauber is going to invest much more time into this layout, especially because developments in this area will not be possible next year - as the 2014 rules stipulate a single exhaust exit close to the centre of the car. That is unless the team is convinced a lot of time can be found quickly.